The Monster Energy NASCAR Cup Series heads to Charlotte (N.C.) Motor Speedway this weekend for its annual fall stop at the North Carolina track. However, for the first time, competitors won’t be competing solely on Charlotte’s fast, 1.5-mile oval. Instead, they’ll be competing on its 2.28-mile, 17-turn “roval” layout which combines parts of the oval with a new infield road course portion of the track. Kyle Busch, driver of the No. 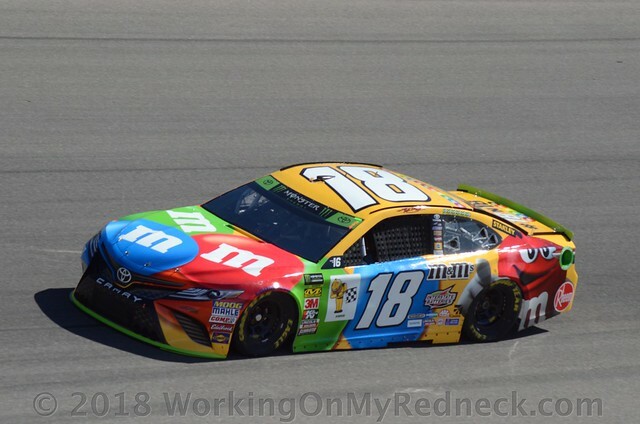 18 M&M’S Toyota for Joe Gibbs Racing (JGR), heads to the new layout and the first cutoff race of the 2018 Cup Series playoffs with a huge sense of relief. His win Saturday night at Richmond (Va.) Raceway automatically advanced Busch and his team to the playoffs’ Round of 12 that starts at Dover (Del.) International Speedway next week. 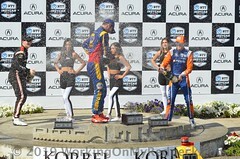 Busch is one of four championship-contending drivers with the luxury of racing this weekend with nothing to lose. 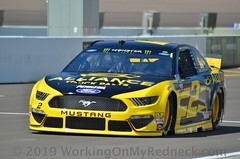 The others are Brad Keselowski, winner of this month’s Las Vegas Motor Speedway playoff opener, Martin Truex Jr., and Kevin Harvick, who will lock in his position in the Round of 12 by simply starting the race Sunday. What does Busch mean by that? “If I’m ever up on the wheel and balls to the wall, I’m going to end up crashed, especially at the roval knowing how treacherous that place is – I’m going to get myself in trouble,” he said. With the pressure off for the time being, Busch can focus on his own pace around the slippery road-course portions through the Charlotte infield, an approach that should garner success despite the unknown nature of this first-time event. Busch is hoping he can equal the feat he accomplished the last time he raced at Charlotte in May, albeit on the 1.5-mile oval, when he brought home his first career points-paying win in Charlotte by winning the Coca-Cola 600, one of the crown jewels on NASCAR’s top series. While this weekend’s Charlotte layout is a first for the series, Busch has established himself as one of the top road-course racers on the Cup Series circuit. If the 2015 Cup Series champion was to grab another checkered flag in Sunday’s Bank of America Roval 400, he could join some elite company as a road-racing ace in NASCAR’s top series. Busch is tied with David Pearson and Mark Martin with four Cup Series road-course wins apiece. That’s some pretty good company, already. But with a fifth road-course win, he could tie Darrell Waltrip, Tim Richmond and Dan Gurney on the road-course win list. There is a bit of distance to the top two spots on the all-time road-course wins list, however, as second-place, Jeff Gordon has seven wins and leader Tony Stewart has nine. Busch scored top-five finishes at the first two road-course races this season at Sonoma (Calif.) Raceway and Watkins Glen (N.Y.) International with finishes of fifth and third, respectively. So as Busch heads into the unknown of the Charlotte roval with the pressure off this weekend, he’ll look to channel his inner “Driving Miss Daisy” in an effort to cap the opening playoff round with his second consecutive win. As much pressure as there is in the playoffs, and as much emotion as you put into everything, how much does winning at Richmond make this weekend easier for you? Will you be able to drive the roval differently because you don’t need to win? How did testing go at the roval? What do you foresee as the most difficult part of the track to figure out at the roval? Is survival the biggest key to having success at the roval this weekend? How do you feel the schedule changes will add to the playoffs? 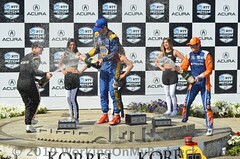 Is it all about winning the opening race in the rounds? The Bank of America Roval 400 will mark Kyle Busch’s 491st career Monster Energy NASCAR Cup Series start. While Busch has 29 NASCAR Cup Series point-paying starts at Charlotte (N.C.) Motor Speedway 1.5-mile oval, Sunday is the inaugural race on the 2.28-mile, 17-turn “roval” road-course layout. Busch has career totals of 50 wins, 30 poles, 179 top-five finishes, 264 top-10s and 15,590 laps led in 490 career Cup Series races. His most recent Cup Series win came last weekend at Richmond (Va.) Raceway. Busch’s most recent pole, the 30th of his career, came at the 1.5-mile oval at Charlotte in May. ‘Rovaling’: While the location is familiar for this weekend’s race in Charlotte, the roval layout will be brand new to the 40 competitors Sunday. Busch has a strong record at each of the other two road-course venues on the Cup Series circuit –Sonoma (Calif.) Raceway and Watkins Glen (N.Y.) International. Combined, Busch has four wins at the two road-course venues, along with 10 top-five finishes and 18-top 10s. 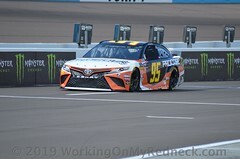 Road-Course Ringer: The Las Vegas native burst onto the road-course scene in 2008 as a constant threat to win as he captured all three NASCAR road-course races he entered that year. 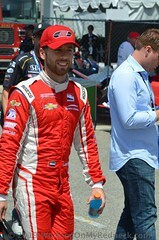 Busch started by taking home his first career NASCAR road-course win in the Xfinity Series race at the Autodromo Hermanos Rodriguez in Mexico City, leading twice for a total of 22 laps. 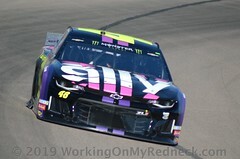 He followed it up by capturing both Sprint Cup road-course events that year at Sonoma and Watkins Glen, leading 78 and 52 laps, respectively, for a total of 130 laps led in the two races. More recently, Busch led 29 laps en route to the Sprint Cup win at Watkins Glen in August 2013, and led 17 laps en route to his second Sonoma win last June. Locked Into Round of 12: Busch’s win Saturday night at Richmond (Va.) Raceway automatically advanced him into the playoffs’ Round of 12, which starts Oct. 7 at Dover (Del.) International Speedway. Busch will look for the Charlotte roval win to add playoff points to his series-high 55. 50 Career Cup Series Wins: With his Cup Series win at Richmond, the 50th points-paying win of his career, Busch is now tied for 11th on the all-time wins list with NASCAR Hall of Famers Ned Jarrett and Junior Johnson. Next up for Busch on the all-time win list is Lee Petty, who had 54 wins during his Hall of Fame career. With his 40th Cup Series victory at Bristol (Tenn.) Motor Speedway last August, Busch became the fourth-youngest driver to reach 40 Cup Series wins at 32 years, 109 days, behind only Richard Petty, Jeff Gordon and Herb Thomas. All 23: With his win at Charlotte in May, Busch has now won a Cup Series race at all 23 tracks at which the series competes, becoming the first driver in the modern era to win at every track where he has made at least one start. Of the 23 different tracks where Busch has won, he has multiple wins at 12 of them. While Busch won for the first time in a points-paying event on the 1.5-mile oval at Charlotte in May, this will be his first opportunity to notch a win at the facility’s roval layout. All-Time JGR Wins Leader: With his Brickyard 400 win in July 2016, Busch passed Tony Stewart for most all-time Cup Series wins for JGR. Busch now has 45 wins for JGR to Stewart’s 33 following his most recent win at Pocono, along with tying Stewart’s Cup Series career win total. 193 and Counting: Busch enters Charlotte with 193 career wins among NASCAR’s top three divisions – Cup (50), Xfinity (92) and Truck (51) – following his Cup Series win last weekend at Richmond.